At a Saturday afternoon press conference with Missouri Governor Jay Nixon, Missouri State Police officials, and local government officials in an area church none of the many questions about when Darren Wilson, the officer who shot and killed Michael Brown would be arrested and charged with murder were continually brushed aside. This, a full week after the shooting of Brown, under conditions where the shooter in the man’s death was immediately known, and is not in dispute. Local people also learned that a midnight curfew in Ferguson would be imposed tonight, and that Missouri Governor Jay Nixon had declared a state of emergency in the city in order to preserve public peace. What the layers of law enforcement officials fail to understand is that the fuel for all the tension in Ferguson is the utter lack of a credible prosecution of a man, who happens to be a police officer in Ferguson itself. The autopsy by the St. Louis County Coroner’s office was completed at mid-week, but not shared at all with the media or the community. Brown’s body was released to his parents who are grieving the loss of a son. The significant thing in terms of the criminal investigation is that if the autopsy were not complete, the body would remain at the County Morgue. Ferguson residents understandably want to know how many times Brown was shot, where he was hit, and what wound was fatal if known. Incident reports made by both Ferguson City Police, and the St. Louis Sheriff’s Department have report numbers indicating that the reports are now public record, but those reports have been withheld all week long with no signs that officials will release it. When finally, the police officer who shot Brown was identified as Darren Wilson, who has six years of police experience and no infractions from his department in that time was released with a surveillance video that shows Brown and his friend in the convenience store near where the shooting occurred. Brown is shown shoplifting a small box of mini cigars and pushing the owner aside. It’s shoplifting plain and simple. Was this a “strong armed robbery” suggesting a much more serious struggle over the cigars? That is highly questionable. I’ve covered beats as a professional journalist for a number of years in my earlier life. I’ve run into incident reports being withheld for a short time, with officers writing them to be able if I had the ability to convince the police captain in charge of them, to find out some basic outline of what happened in a murder, until the report was finalized. But I have never, ever heard of doing so for a full week and suggestions made by the Ferguson Police Chief at mid-week that a toxicology screen not available for a month or more would control when any information would be released. If I were on scene covering this story, covering the Ferguson City Police beat along with the St. Louis County beat, what we called going to “the cop shops” daily, and looking at the daily logs to see any incident reports worthy of putting on the air in my case on a radio news broadcast, I would be forced to tell listeners in blunt fashion that this lack of procedural transparency is not only highly irregular, but points directly to what might be obstruction of justice or gross incompetence. And the failure of District Attorney McCulloch to even file a charge or charges a full week after the basic facts are known both strains credulity, and raises the perception, if not the fact that McCulloch might even fail to prosecute, and if he finally does, that citizens of Ferguson have every right to question the integrity of this investigation. Ferguson’s black population saw or learned of a police officer who used deadly force repeatedly when the young man by three witnesses, not connected to each other report the suspect, Michael Brown stopped, and this after he was hit at least once, and on his knees pleaded for the officer NOT to shoot him as an unarmed person. He also had put his hands, minus anything up in what is the commonly understood signal he was surrendering to the officer, and would be compliant to being cuffed and taken to headquarters in the back of a police cruiser. That’s the core of it. Why did Darren Wilson continue to fire multiple shots into Michael Brown when deadly force was so patently unnecessary to put him into custody and into the justice system to himself be charged and arraigned post haste. The Justice Department and some forty plus agents of the FBI are canvassing the city for witnesses. They’ve already questioned and have material for reports on the three main eyewitnesses. But as black witnesses even in the Twenty-first century are far from equal to even one white witness, the FBI knows they need two or three more. 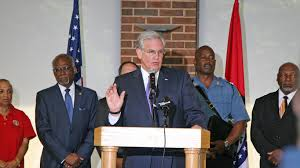 Governor Jay Nixon centered the press conference on what he had done to enforce the curfew and keep the peace. Captain Ron Johnson of his State Patrol also answered questions but it was obvious to this reporter that they have him under tight restraints in doing a thing related to the actual investigation. More than one questioner asked by almost yelling at the podium that there would be no peace without a measure of justice, and information as to how justice is actually proceeding in this case. Sadly, Nixon continued to assert that peace must come first, and that there is some improbable future date, unknown to him (The Governor of the State of Missouri) when an arrest, if one will ever be made, will happen. Remember it took Sanford Florida police and the county District Attorney 38 days to actually make the arrest of George Zimmerman, who was declared by a jury verdict not guilty of killing Trayvon Martin, but was actually acting under his right to defend himself. We at Struggles for Justice accept the verdict of the jury, however inadequate it seems. It is the eerily similar problem in Ferguson that raises a set of huge legal and moral questions about the Brown shooting. Until officials start sharing what should have been available within the first few days of the investigation, Ferguson will be a tinder box. The people there need a sign of justice, however small, to remain peaceful and hopeful that full justice will be done eventually . This entry was posted in Community and Citizen Action, National Affairs, Race, The Faith Community and tagged Captain Ron Johnson, Darren Wilson, Ferguson, Governor Jay Nixon, Michael Brown, Missouri, Missouri Governor Jay Nixon, police officer, Unrest in Ferguson. Bookmark the permalink.